It’s only week 3 and we’ve already seen some interesting and innovative ideas presented to the Dragons in the Den. But what’s next? Tonight I’ll be looking at trade marks, registered designs and top tips for brand protection. Tom Harrington was first to pitch tonight with his online estate agency, WeSold.co.uk. The unique property selling website initially got the Dragons excited and Tom looked like he could close the deal on the £75k investment he wanted. As the Dragons noted, it’s difficult for Tom to protect his business model. This means it could be easy adopted by the leaders in the online property market. But there are ways in which he could protect the brand, to reduce the chances of copycat websites appearing under similar branding. Unable to sell his idea, Tom left the Den without investment as the 5 Dragons declared themselves out. Next to brave the Dragons were tea-making duo Philip Perera and Omar Farag of The Teabox Company Limited. They were looking for £50k for 15% of their business. 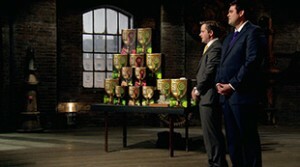 Their clever vision and determination got the Dragons in quite a stir and 3 offers were made for the full amount but for higher equity levels. The company have already registered their logo as a trade mark (UK00003041764) but, as Kelly Hoppen pointed out, the design of their packaging could be improved. After brewing over their decision, Philip and Omar accepted Kelly Hoppen’s offer of £50k for 25% equity (dropping to 20% on seeing a return) and happily walked out of the Den. Since filming the show, The Teabox Company have withdrawn the trade mark application for their name after it was contested. They have now rebranded the company and applied for the name Phom instead. This proves just how important it is to get your name right from the start. Akeem Ojuko showcased his flavoured peanut butter brand, The Wild Peanut, asking for £50k for a 20% share to help expand his start-up business. Despite having carefully developed the brand, Akeem doesn’t yet seem to have put the necessary precautions in place to protect it. Like Peter Jones said, the idea could be easily replicated, so a strong brand identity would be help stand out against competitors. Owning a limited company (registered with Companies House) doesn’t mean you can stop others using similar trading names. The only way to do this is to register your name as a trade mark. Carry out a trade mark search to see if anyone else has registered a similar name, logo or slogan before settling on yours, to help avoid future problems. Make sure that you stand out from the crowd. A good trade mark is distinctive, can raise the profile of your brand and become sign of quality in your industry. Follow the rules for choosing a successful trade mark. Coming to a sticky end, Akeem became another casualty of the Den and walked away empty handed. Home-brewers Ralph Broadbent and Alex Dixon asking for £40k in return for a 15% stake in Victor’s Drinks. Home-brewers Ralph Broadbent and Alex Dixon were the final entrepreneurs welcomed into the Den tonight. They were asking for £40k in return for a 15% stake in Victor’s Drinks, which allows buyers to make their own cider in just 10 days. The duo have applied for a trade mark for the name Victor’s Drinks (UK00003048892) which will help protect the company from others trying to trade under this name in the same or similar industry. I’ll confess I don’t understand how the brewing process works, but if their methods were new and unique, they could have protected this with a patent. However, it is always advisable to contact a patent attorney or other IP professional for advice and guidance. A last minute change of mind presented the duo with an opportunity to secure an investment and they left in the lift with £40k (and the expertise of Duncan Bannatyne) in return for a 25% share of the business. If you would like to find out more about any of the IP mentioned in this blog and the ways in which it might affect your business, the free to use, fully interactive, online tool IP Equip is a great place to start. I wondered if the brew in the box would be patented. I was surprised how scathing the dragons were about this product, its biggest failing being its retail price above the cost the of cider out the supermarket. Something Debra Medina missed believing £1.25 was below cost when actually far above. If this product could be patented would think would have real potential if could get the retail price down, particular moving forward with minimum alcohol pricing. If could squeeze the price, make this a value product. As with minimum pricing proposed here in Scotland a bottle of white lighting would cost £7.50, currently about £2.50. Look at how the price manipulation through differential duty has made smokers switch from rolling tobacco a very small market 25 years ago to being almost the norm amongst some groups students etc. Rolling tobacco a small skiddle but big saving, this product likewise if protectable, this product could have a large part of the current cheap cider market if we end up with government price fixing. This market is larger than the home brew market. This product could have great potential if could be protected as would circumvent minimum pricing so if squeeze the price would be massive potential. Home brewing may become quite a growth industry if minimum pricing comes in as you don’t pay duty on it, and it would be impossible for duty to place on conventional home brewing as just need apple juice and yeast can be constantly reused. Peter Jones fixated on the home brew market; however this product could create a whole new market segment that is differenced from the home brew market. As people may buy this who would not want the skidlid of home brew have the space. The buyers of this product unlikely to be convention home brewers as would cost more, this product may bring in whole new category. If this product is not protectable could see great potential if minimum price comes in for cheap copies. If it is then this product would have almost a monopoly. It may be the dragons wealth or lack of familiarity with the market or failure to think outside the box but was quite surprised and how they failed to grasp this product. I suppose being on tv and had some luck previously may make someone over value there own judgment etc when lack the knowledge to make a judgment. Even with current pricing if priced squeezed a good nesh product, with minimum pricing this could be on sale in every Lidl Aldi Tesco or discount retailer where people currently purchase cheap price cider.